Therapeutic Touch (TT) is one of many forms of alternative therapies; a non-contact, form of treatment, described by Krieger (1986) as, "…a healing meditation;" (p. 35). She also claims it is a "natural human potential" which, "…elicits a generalized relaxation response, …" (Krieger, 1986, p. 16), that it reduces pain, (Krieger, 1993, p. 13), accelerates healing (pp. 13-14) and is helpful in alleviating psychosomatic disorders such as asthma, (p. 14). Most alternative therapies are remnants of a time before the appearance of scientifically based concepts of medicine; a time when, without understanding the actual causes of infection and illness, alternative theories, based upon religion, superstition and pseudo-science, offered the only explanations. While one would expect that, with the emergence of scientific medicine and an understanding of the causes of disease, such primitive theories would have been discarded, unfortunately this is not what has happened! Not only have these alternative, non-scientific therapies persisted, but regrettably, in our present era, they have become increasingly more popular; approximately 50% of Americans now consult alternative therapists for health problems, (Greenwald, 2001). Even more disturbing is that, despite their lack of scientific validity, some forms of alternative therapy are now being taught at tertiary institutions, sadly, TT has infiltrated the nursing profession and is now so widely accepted, it is included in the teaching syllabus of many nursing colleges. 1) If the claims made about TT are valid? 3) Does TT meet the levels of objective criteria required of modern health therapies? To better appreciate the fundamental principles that are the basis of TT one must first abandon all modern and orthodox scientific ideas in favour of a world-view where the fundamental forces driving the universe beliefs are metaphysical and vitalistic. Traditionally, vitalism claims that these animating energies generate a field of invisible light, known as the Aura or the human energy field (HEF). Paracelsus (1493-1541) described this as a luminous sphere of multicoloured lights and that brightly glowing colours in the HEF indicated good health, while dark colours, (which, it was claimed, were usually located directly over the affected area), indicated ill-health. It was claimed that not only could this energy field be "seen" by those with special abilities, but they could also use it to interpret the individual's state of health by examining these various colours within the HEF; this then is the basis of TT. The HEF is an essential component of TT; it was described by the Theosophist Blavatsky, (1889) as a form of "psychic effluvium", produced by the intense energies radiating out from the body, and, that displayed within the HEF, are detectable patterns of both mental and physical energy! Kunz and Peper (1995) claim these patterns are reflections of our individual thoughts and emotions, while the patterns of physical energy reflect the function and operation of every body organ. She claims that therapeutic touch practitioners, (TTP) are not only able to use their special abilities to "perceive" signs within the invisible HEF that indicate whether the individual is healthy or not, but even more extraordinarily they are able to manipulate "…the human body's energy fields: the external etheric body or aura and the chain of internal energy centres or chakras" (Rubens, Gyurkovics and Hornacek, 1995, p. 1262) to restore the sick to good health! According to Krieger, when therapeutic touch practitioners (TTP) move their hands within the invisible HEF, (but without actually touching the body), they are able to detect and interpret the subtle energy patterns within the HEF. Autonomous, (balanced) patterns, indicate good health while "dysrhythmic" (out of balance) patterns, indicate the presence of illness. If they "perceive" signs which indicate the individual is unhealthy, then they are able to manipulate the HEF restoring balance and stability to the HEF, which produces a condition of good health in the patient! Furthermore, if the patient is suffering a "depletion" in vital energy, the TTP can transfer some of their own life-force energy, (via their hand chakras), into the patient's HEF, boosting the patient's own healing system, and accelerating the speed of their recovery! Although in the West the vitalistic energy had been principally perceived as a form of spiritual form of energy, from the 16th century onwards, especially after 1600 when William Gilbert published his De Magnete, Magneticisque Corporibus, et de Magno Magnete Tellure ("On the Magnet and Magnetic Bodies, and on That Great Magnet the Earth"), this force was increasingly perceived to be a form of magnetism, or a magnetic fluid. Although the concept of the form of the energy changed, the essential belief remained that human illness was due to either depletion or imbalance of this energy remained. Principal advocates of the magnetism theory were Jan van Helmont, (1580-1644) and Mesmer, (1734-1815), and their ideas that were to form the basis of the many "bioenergetic" theories that would emerge in the following centuries. Helmont believed "dominant" individuals could "discharge" their own "magnetic fluid" into other, weaker individuals, overwhelming their will. Mesmer, who combined astrology, mysticism and vitalism with some of Helmont's ideas, claimed the universe was filled with a mysterious cosmic energy, a gravitas universalis, (Zweig 1932, p. 19). He called this substance ‘animal magnetism' and he believed that humans, were especially susceptible to the actions of the, "… earthly and celestial magnetic forces" (Oldfield and Coghill, 1988, p. 45), and that, "…an imbalance of the universal fluid within the body produced illness." (Wolberg, 1948, p. 2) He believed that magnetism could be used by healers to cure the sick and he began to use magnets, waving them over and around patients, believing this would restore the internal balance of their animal magnetism, and so would cure them. He "progressed" to having patients sit around tubs of "magnetized water" holding metal rods immersed in the water so as to receive the magnetic energy. Later, he adopted Helmont's practice of discharging his own "healthy" animal magnetism into patients by, "…passing his hands up and down the length of the patient's body without actually touching the surface." (Miller, 1997, p. 5) Later this technique came to be known as "magnetic" or "mesmeric passes". Ultimately, hundreds of these alternative "therapies" including TT would follow the basic pseudo-scientific ideas of Helmont and Mesmer in claiming to be able to identify depletions or imbalances of the "vital" fluid and to be able to restore the normal flow and balance of the internal energy. c) That the chakras were important components in that they could be used to transmit "healing" energy from healers into patients. Rosa, Rosa, Sarner and Barrett (1998) tested twenty-one TTP's in a situation whereby the TTP's were unable to see the subjects. Depending on the toss of a coin, the subjects would place their right hand directly above either the TTP's right or left hand. Required to identify which hand was being tested, the TTP's were correct in only 44% of the tests, a rate which as Rosa et al. (1998) observed, "…is close to what would be expected for random chance." (p. 1005), clearly suggesting the TTP's were unable to "feel" the HEF of the test subjects. Overall, like many alternative therapies, TT appears to be little more than an elaborate charade; however, to be fair, it does seem that TT can actually produce relaxation, reduce pain, accelerate healing and is useful in treating psychosomatic disorders; however, while Krieger attributes these effects directly to the TT process, it appears that she has either little understanding of, or has chosen to overlook the fact that there are other well-known psychological principles that are capable of producing such physical responses in patients. Krieger (1993), claimed that the responses of TT patients are not, "…solely or overtly due to suggestion or persuasion." (p. 11), and, that the process does not involve, "…a passive, trancelike, or hypnagogic state." (p. 13) However, the facts clearly contradict these claims. Indeed, when one examines the instructions given by Krieger, (1993, pp. 22-31), to enable the TTP to assess the HEF it is quite clearly a hypnotic induction combining both autohypnosis and heterohypnosis techniques, one that relies primarily upon the power of suggestion for both the TTP and the patient. Kroger (1977) defined suggestion as "…the uncritical acceptance of an idea … the process by which sensory impressions are conveyed in a meaningful manner to evoke altered psychophysiologic responses." (p. 7). Suggestions can be verbal, nonverbal, direct or indirect, and can even involve such innocuous factors as the appearance, behaviour, gestures and facial expressions of others, especially the therapist. Suggestion is particularly powerful when specific social and cultural expectations of an individual are utilized. Thus, a witch doctor shaking his rattle and uttering magical spells, a Christian priest sprinkling holy water and praying, a magnetizer making "magnetic passes", or a TTP waving their hands around a subject are all creating powerful suggestions attuned to the particular beliefs and expectations of their subjects. Even if the subject is not a believer, there are still powerful underlying influences that can influence behaviour and produce a psychosomatic response in subject. As Hebb (1955) indicated, when an individual experiences a reduction in sensory input, or they are subjected to a monotonous or unchanging condition, the sensory system of the brain tends to shift its focus, and subjects can experience altered states of consciousness (ASC) which can be manifested as imaginary visual, auditory or kinetic sensations. Given that the TTP would likely have a strong belief in the effectiveness of the TT process, and their clients would probably have similar opinions, it should not come as a surprise to find that both the TTP and the subject would experience certain psychosomatic experiences. While emphasizing the "metaphysical" aspects of TT, Krieger unintentionally revealed that, during the Centring Phase, the TTP enters, and remains in, an autohypnotic condition. This is evident from Krieger's own descriptions of Centring, she describes the process as, "…an act of self-searching, a going within to explore the deep levels of yourself" (Krieger, 1993, p. 17) and elsewhere as a, "…qualitatively different state of consciousness and quietude." (Krieger, 1995, p. 265) Such descriptions are clearly indicative of an ASC. This fact that this "centered state of consciousness" must be maintained throughout the entire TT healing process (Krieger, 1986, p. 37; 1993, p. 18; 1995, p. 265) reinforces the impression that the TTP is actually in an ASC, and, in such a condition, would be particularly sensitive to any impressions, real or imaginary, that might occur to them during the time they are sweeping their hands around the patient. Her claims that, during this time, TTP's are able to perceive "variations of energy" within the HEF, are easily explained, for if the hands and arms are held upright or waved around for a period of time, in the manner recommended for the TTP, definite physical sensations do appear in the arms, however, these feelings are nothing more than the sensation of muscle fatigue. However, while only muscle fatigue, these feelings would have a powerful effect on someone expecting to receive definite "impressions" from the HEF, and would serve to reinforce their belief of anyone using this technique that they had actually experienced some form of "metaphysical feedback". Most importantly, the hand-waving process serves another purpose; to hypnotize the patient. As previously mentioned, the technique known as magnetic, mesmeric or hypnotic passes, was once used by Mesmer and his disciples, (Moss 1979), who erroneously believed it enabled them to transmit "magnetic energy" into their subjects. This same process was widely used in the past as an effective form of anaesthesia. During the 1840's, English surgeon James Esdaile, who worked for the East India Company, had his Indian assistants relax company labourers with a combination of mesmeric passes and by gently breathing upon them while he operated. Using this as the sole form of anaesthesia he successfully conducted hundreds of "painless" operations, including more than 200 major operations involving the removal of scrotal tumours. Esdaile believed that this technique, based as it was upon mesmerism, was a relatively new process, but later, as Edmonston (1981) noted, he discovered that a similar method, known as jar-phoonk (from the Hindu Jarna – "to stroke" and phoonka – "to breathe"), had been widely used by Indian conjurors and holy-men for hundreds of years. In the past it was widely believed that during mesmerism passes, "…a vital force or fluid…passed from the operator to the patient, affecting the latter's nervous system." (Edmonston, 1981, p. 12) This erroneous belief persists, not only in many primitive cultures, but also amongst many advocates of alternative therapies. Thus Kurtz, Alcock, Frazier, Karr et al. (1988), found similar claims being made about the abilities of Chinese Qigong Masters, who, like TTP's, claim to be able to project healing energy into patients, but over much greater distances. However, in tests, with the QM hidden from view, it was found that the patient reacted even when the QM was not transmitting "energy", clearly revealing that the primary agent involved was simply suggestion. 4. Claims by Krieger (1993) that TT accelerates healing is similar to the findings of Margolis, Domangue, Ehleben, and Schrier, (1983), Golan (1986) and Barber (1978) who all noted that hypnosis could increase blood flow throughout the body, helping to repair tissue and speeding up overall recovery. Similarly, Hart (1980), Enqvist, von Konow, and Bystedt (1995), reported that hypnosis reduced blood loss and improved blood pressure, not only during surgery, but also during the post-surgical recovery phase, factors that generally assisted the overall healing process reducing the recovery period. Haskins (2001) noted that hypnosis improved, "…patient outcomes and…overall patient satisfaction." (p. 160). Hypnotic relaxation is also extremely effective in reducing post-surgical recovery time, post-operational pain, reducing levels of patient distress and anxiety. Finkelstein (1991) and Kessler and Dane (1996) noted its effectiveness as a "preparation strategy" reducing premedication levels; anaesthetics; post-surgical pain; post-operative medication; and that it decreased the period of recuperation by an average of 2.4 days. 6. Reflecting the claimed effectiveness of TT in treating asthma, (Krieger, 1986), it is widely acknowledged that hypnosis is a most effective treatment for many examples of asthma. As Gardner and Olness (1981) observed, hypnotherapy is an extremely effective treatment for some types of asthma, especially the intrinsic variety, which is primarily psychosomatic in origin, (p. 19). The overwhelming evidence from TT literature is that the entire process is really nothing more than a form of hypnotic induction involving a light trance level in both the subject, and the TTP. This is not an uncommon phenomenon; many "alternative therapies" employ light hypnosis to produce various forms of ASC. For subjects, usually unaware of the true nature of the hypnotic process, entering into an ASC can often appear to be a rather mysterious, other-worldly experience. At the same time the TTP, with their own specific behavioural expectations, appear to erroneously interpret the physical sensations they experience, (along with the responses of patients), as evidence supporting their own beliefs, a combination which further reinforces their beliefs and expectations. One particular "problem" with hypnosis is that it can be easily produced, even by inexperienced operators who are unaware of what they are doing! Contrary to common belief, hypnosis does not require a complex induction process or a deep level of trance to be effective. In reality, most induction techniques are extremely subtle and produce only light trance levels, nevertheless these can still be extremely effective in triggering suggestions. Hilgard and Tart (1966) even demonstrated that subtle hypnotic techniques used on wide-awake subjects were just as effective in producing high levels of response to suggestions as were techniques using deep trance inductions, (p.207). These facts help to explain why it is that so many alternative therapists, who are generally totally ignorant that their treatments involve hypnotic techniques, can often inadvertently produce hypnotic conditions in their patients. Examination of the TT process suggests that it is neither new nor original, and merely presents such well-established psychological strategies as relaxation and suggestion in the form of a fanciful, pseudo-scientific charade. • The first step in the TT process, assessing the HEF, is based upon rather imprecise principles; rather than empirical observations the TTP is encouraged to make a diagnosis on the basis of, "…vague hunches, passing impressions, flights of fancy… " (Krieger, 1993, p. 29); they are encouraged to, "Accept whatever impressions arise…" (p. 29). Krieger claims that impressions simply "pop" into her head, "…thoughts about patient's conditions … They come seemingly from nowhere –"(Krieger, 1995, p. 268). • Strangely while possessing a legitimate scientific background, when it comes to glorifying TT, she uses irrational logic, admitting that her belief in the existence of the various components of TT are based entirely upon faith; "Although until this day I do not "see" either the human energy fields of the personal self or the chakras embedded within them, I believe…" (Krieger, 1997, p. 44). perceives as "a healer of universal mind-energy" (Krieger, 1995, p. 267). The popularity of TT within the nursing profession appears to be an example of "collective wish-fulfillment" to possess what Bartholomew, (1997) referred to as, "Transcendence and magical or supernatural powers…" (p. 32). TT provides its users with special status as practitioners of an acceptable, alternative form of "medical" intervention, and accentuates the role of women as the carers and "healers". In past ages it was the "wise-women" who were revered and respected by villagers, partly for their supposed relationship to the natural world and for their arcane wisdom, but principally for their role as the principal healers of the common folk. Eventually, they were usurped by university trained physicians, and they became outmoded relics of an archaic past, overlooked and forgotten, accused of being witches. Now, however, at least in the field of male dominated secular medicine, it may be that TT provides women with an opportunity to regain some of their former status as the natural, mystical healers. Driven predominantly by professional female nursing acolytes, TT utilizes a body of quasi-medical wisdom that not only fulfils certain psychological and spiritual needs, but provides women with a degree of authority and power. Despite serving these socio-political needs, TT lacks any credible scientific evidence to support its fanciful claims. Based as it is upon subjective, non-scientific metaphysical and philosophical belief systems, rather than solid empirical evidence, TT fails to meet the objective criteria required of modern health therapies. Bartholomew, R. (1997). Collective Delusions: A Skeptic's Guide. Skeptical Inquirer, 21(3): 29-33. Barber, T.X. (1978). Hypnosis, suggestion and psychosomatic phenomena. American Journal of Clinical Hypnosis, 21, 13-27. Bernheim, H. (1886). Suggestive Therapeutics: A Treatise on the Nature and Uses of Hypnotism. London: G.P. Putnam's Sons. Blavatsky, H.P. (1889). The Key to Theosophy. Madras, India: Theosophical Publishing House. Bowers, K.S. (1976). Hypnosis for the seriously curious. New York, NY: W.W.Norton & Company. Carroll, R.T., (2003). The Skeptic's Dictionary. Hoboken, NJ: John Wiley & Sons, Inc.
Edmonston, W.E. (1981). Hypnosis and Relaxation: Modern Verification of an Old Equation. New York, NY: John Wiley & Sons. Enqvist, B., von Konow, L. and Bystedt, H. (1995). Pre- and perioperative suggestion in maxillofacial surgery: effects on blood loss and recovery. International Journal of Clinical and Experimental Hypnosis, 43, 284-294. Feuerstein, G. (1987). Prana. In, Encyclopedia of Religion, Eliade, M., Editor in Chief, New York, NY: Macmillan Publishing Company, volume 11, 483-484. Finkelstein, S. (1991). Hypnotically assisted preparation of the anxious patient for medical and dental treatment. American Journal of Clinical Hypnosis, 33, 187-191. Gardner and Olness, (1981). Hypnosis and Hypnotherapy With Children. New York, NY: Grune & Stratton. Glickman, R. (1997). Touch of Mysticism. Swift, 1 (2), 1, 15-19. Golan, H.P. (1986). Using hypnotic phenomena for physiological change. American Journal of Clinical Hypnosis, 28, 157-162. Greenwald, J. (2001). A new breed of healers. Time, April 16: 61-67. Guiley, R.E. (1991). Harper's Encyclopedia of Mystical and Paranormal Experience. Edison NJ: Castle Books. Hart, R.R. (1980). The influence of a taped hypnotic induction treatment procedure on the recovery of surgery patients. International Journal of Clinical and Experimental Hypnosis, 28, 324-332. Hebb, D.O. (1955). The mammal and his environment. American Journal of Psychiatry, 8:2, 826-831. Hilgard, E.R. and Tart, C.T. (1966). Responsiveness to suggestion following waking and imagination instructions and following induction of hypnosis: Journal of Abnormal Psychology, 71 (3), 196-208. Kessler, R. and Dane, J.R. (1996). Psychological and hypnotic preparation for anesthesia and surgery: An individual differences perspective. International Journal of Clinical and Experimental Hypnosis, 44,189-207. Krieger, D. (1986). The Therapeutic Touch: How to Use Your Hands to Help or to Heal. New York, NY: Prentice Hall Press. Krieger, D. (1993). Accepting Your Power to Heal: The Personal Practice of Therapeutic Touch. Santa Fe, New Mexico: Bear & Company Publishing. Krieger, D. (1995). High-order emergence of the self during Therapeutic Touch. In, Spiritual Healing. Kunz, D., compiler. Wheaton, Illinois: Quest Books – Theosophical Publishing House, 262-271. Krieger, D. (1997). 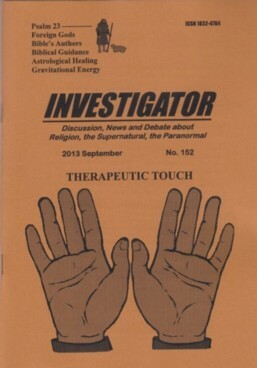 Therapeutic Touch Inner Workbook: Ventures in Transpersonal Healing. Santa Fe, NM: Bear & Company. Kroger, W.S. (1977). Clinical and Experimental Hypnosis in Medicine, Dentistry, and Psychology. Philadelphia: J.B. Lippincott Company. Kunz, D. and Peper, E. (1995). Fields and their clinical implications. In, Spiritual Healing, Kunz, D., compiler. Wheaton, Illinois: Quest Books – Theosophical Publishing House. 213- 261. Kurtz, P., Alcock, J., Frazier, K., Karr, B., Klass, P.J., and Randi, J. (1988). Testing PSI Claims in China: Visit by a CSICOP Delegation. Skeptical Inquirer, 12:4, 364-375. Leadbeater, C.W. (1927). The Chakras. Wheaton, Illinois: The Theological Publishing House, (1987 edition). McConkey, K. M. and Barnier, A.J. (1991). The Benjamin Franklin Report on Animal Magnetism: A Summary Comment, Australian Journal of Clinical and Experimental Hypnosis, 19, 77-86. Macrae, J. (1995). Therapeutic Touch as meditation. In, Spiritual Healing. Dora Kunz, compiler. Wheaton, Illinois: Quest Books – Theosophical Publishing House, 272-288. Maddocks, I. (1985). Alternative medicine. The Medical Journal of Australia, 142: May 13, 547-551. Margolis, C.G., Domangue, B.B., Ehleben, M.S. and Schrier, L. (1983). Hypnosis in the early treatment of burns: A pilot study. American Journal of Clinical Hypnosis, 26, 9-15. Miller, J (1997). Going Unconscious. In, Hidden Histories of Science. Silvers, R.B. editor, London: Granta Books. Moss, T. (1979). The Body Electric. Los Angeles, California: J.P. Torcher, Inc.
Oldfield, H. and Coghill, R. (1988). The Dark Side of the Brain. Longmead, Shaftesbury, Dorset: Element Books Ltd.
Oltramare, P. (1921). Theosophy. In, Encyclopaedia of Religion and Ethics. Hastings, J. editor, Edinburgh: T. & T. Clarke; volume 12, 304-315. Raso, J. (1995). Mystical Medical Alternativism. Skeptical Inquirer, 19:5, 33-37. Raso, J. (1996). The Dictionary of Metaphysical Healthcare. Buffalo, NY: Prometheus Books. Rosa, L., Rosa, E., Sarner, L. and Barrett, S. (1998). A close look at Therapeutic Touch. Journal of the American Medical Association, 279, 1005-1010. Rubens, D., Gyurkovics, D. and Hornacek, K. (1995). The cultural production of Bioterpia: psychic healing and the natural medicine movement in Slovakia. Social Science and Medicine, 41(90, 1261-1271. Wager, S. (1996). A Doctor's Guide to Therapeutic Touch. New York, NY: Berkley Publishing. Weitzenhoffer, A. M. (1957). General Techniques of Hypnotism. New York: Grune & Stratton, Inc.
Wolberg, L.R. (1948). Medical Hypnosis. New York: Grune & Stratton. Zweig, S. (1932). Mental Healers. New York, NY: Frederick Ungar Publishing Co.